To go straight to the exercise, please scroll/swipe down. Are you flexible just before bed but really stiff in the morning? The problem can be that what you’ve been doing during your day, fatigues and wears your joints, muscles and discs. When this happens, your body’s natural endorphins then kick in to help relieve the pain. However, as the numbing effect wears off overnight, you begin to hurt again and become stiff. What we don’t realize is that weak and tight muscles are always in a fatigued and sore state. 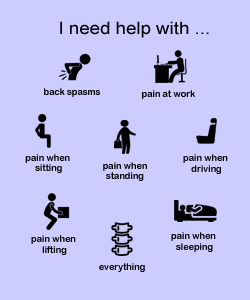 The chronic pain will also cause them to tighten further, causing you to feel very stiff, affecting your quality of sleep. Although there may be other reasons such as the quality of your mattress, sleep position, body weight and more, this is the main problem likely affecting you now. This site can show you many great reconditioning movements that you should be performing to help you with your morning stiffness. 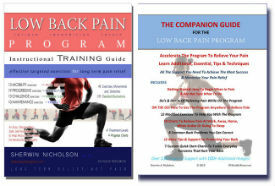 They’ll relieve both the tightness and imbalances that the lower back and hip muscles have developed from fatigue. It is illustrated below from #8 from the Challenging Exercises (See Table of Contents). Encouraging your gluteus maximus to contract (for hip mobility and support). Strengthening your gluteus medius (for hip mobility, reduce hip stiffness). Stretching both the deep muscles of the spine and back (reduces low back stiffness). Strengthens the abdominals (reduces excessive anterior pelvic tilt). Step 1: Stand upright, raise one leg and hold it up unassisted. Allow the unsupported hip to drop. 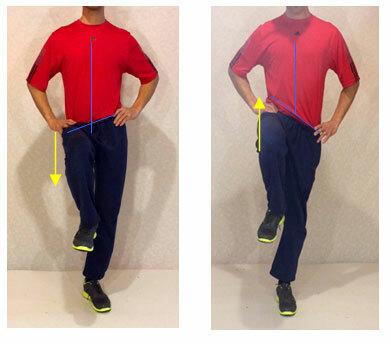 Step 2: Raise the elevated and unsupported side of the hip by flexing the standing hip. Raise in a slow and controlled fashion as high as possible. Your hip should be raised from below the level position to above level. Step 3: Hold the contraction and keep your hip raised for 1-10 seconds. Step 4: Return to a rest position. Step 5: Repeat with the other leg and hip. Step 6: Repeat this entire shift but now with a forward lean. Contract your abdominals and hold 1- 10 seconds. This is a tough exercise to perform initially, so it is better to perform it while lying down on your bed or the floor. Your initial stiffness you prevent you from fully executing the movement but should improve over time. When standing, remain near a support to keep yourself from falling, until your balance improves. It is important to shift your hips with respect to the blue axis lines indicated in the images above. Tight and stiff hip muscles make this movement very difficult. At first, you may only be able to shift a very slight amount. With practice and increased strength and flexibility, you will be able to shift your hips with greater degrees of motion.